Indonesia has large population of Muslim which is almost 80% of the total population is Muslim. Therefore, there are many various buildings which are established for Muslim, for example is a mosque. Mosque is the crucial and important building for Muslim to pray and worship. The architecture building of some mosques is majestic and such a great view to be seen when you come to Indonesia. Also, Indonesia hosts so many unique and spectacular mosques which are known by the tourists in the world. There, you can find mosques in many variant architecture, size, and decoration; from the biggest, the oldest, and the most majestic view of mosque. There are many famous mosques in Indonesia which are known not only by Indonesian, but also by the tourists over the world. Then, there is a list of two beautiful mosques in Indonesia which are popular among people. Istiqlal Mosque-If you are talking about which are the most famous mosques in Indonesia, then you should not miss this mosque. This mosque is the largest mosque in South East Asia which is located in Jakarta, the Indonesia’s capital city. It was established in 1970 and in 1978, it was inaugurated. 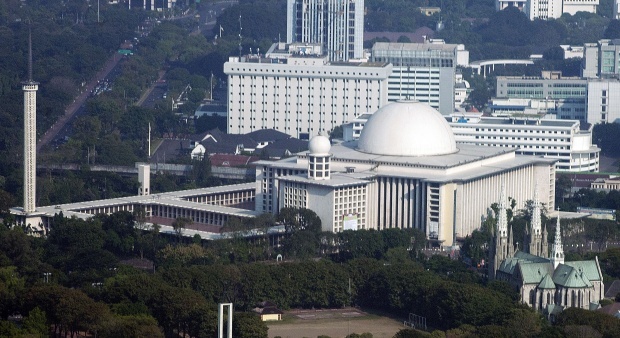 Specifically, the location of Istiqlal is in St. Taman WijayaKusuma, Central Jakarta. Istiqlal has the meaning of independece which reminds the struggle of Indonesian people to get their national independence in the past. This mosque can accommodate for more than a hundred thousand people, it is such a great capacity. It has 45 m of dome’s diameter and has 12 columns that are covered by the aluminum plates. This Istiqlal mosque stands in the right across of the old and great Catholic Church. The mosque’s decoration was created by FrederichSilaban in 1954 which is a Christian from Sumatra. This mosque is not only available for Muslim visitors, but also non-Muslim also can visit this mosque. They have permission to visit this mosque and enter it after having such a short brief of Islam religion and about the mosque itself. Moreover, they should follow the rules of entering mosque by putting off any footwear and wearing the appropriate attire such as long sleeve shirt and trousers. There, they are requested to wear hijab for women and sarong for men. Since there are some areas which are not allowed for public, then the visitors have to be accompanied by a guide. 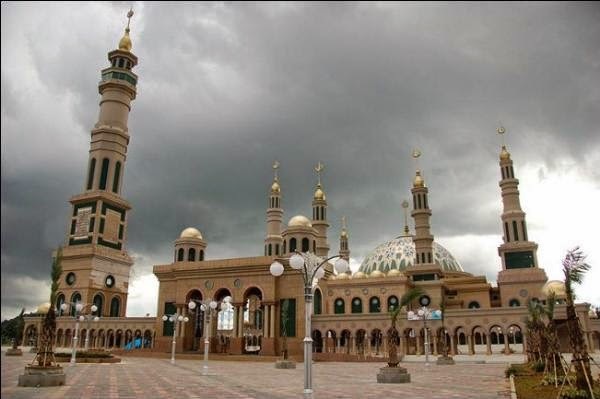 Islamic Center Mosque-Islamic Center Mosque is located in Samarinda, East Kalimantan, Indonesia. It is famous mosques in Indonesia you must visit since it is the second largest mosque after Istiqlal Mosque. This mosque has an amazing and panoramic view. It is such a magnificent mosque that you have to visit if you come to have a vacation in Indonesia and Samarinda is your next destination place. It is located near Mahkamah River so you will not only see the majestic view of the mosque, but also the great view of this river. Islamic Center Mosque has 99 meters of height and there are 7 towers in it; one of them is full of list of AsmaulHusna. Such a great destination place for your vacation!